Below is the calendar of all that is happening in Medina, NY. You may adjust the look of the calendar by choosing "View" below. The calendar may be filtered by using the options on the right. It is FREE to post events. Easily add events to your personal calendar, or receive a reminder text or email by clicking on the "Other Event Actions" dropdown. 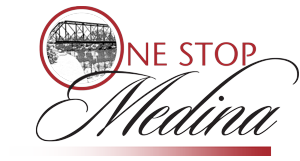 Want to have your event featured on One Stop Medina? (the bright yellow events). After you have submitted your event, visit here and follow the simple steps. For more help, or to view our frequently asked questions, please see our Calendar Help.